U.S. military psychic spies, homicide cases, messages from the other side, spiritual healing—Marla Frees was given a gift few receive, and she uses those gifts from “Spirit” to help others. While shooting a TV commercial in Los Angeles, Marla Frees was given a message. The father of the actor sitting across from her wanted the actor to know he was happy about the new baby. But there was a twist—the father was deceased. The actor was shocked. Marla was God-smacked. Increasingly, messages from deceased loved ones and a powerful psychic awareness demanded her attention. Marla followed her heart, left acting, and never looked back. She now uses her gifts to help families from the heartland to Hollywood find healing. American Psychic tells the spiritual journey of a small-town girl who develops her psychic gifts and relationship with God on a synchronistic path that weaves through the trauma of her childhood, the drama of her acting career, and adventures in healing and transformation. Along the way, she’s explored her abilities with U.S. military “psychic spies,” assisted detectives on homicide cases, and delved into the science behind her abilities with physicist Thomas Campbell. Marla has learned to trust the voice of “Spirit,” which never fails her. Marla Frees’ story of spiritual transformation takes us into realms that will astonish, inspire—and heal. "Fearless and utterly fascinating...I have known Marla as a gifted teacher and witnessed her work first hand, and reading AMERICAN PSYCHIC, it's clear she is as good a storyteller as she is a master of her other callings. She makes the 'incredible' totally relatable and the 'impossible' inescapable and divine." "AMERICAN PSYCHIC takes us on a journey of discovery and reckoning as Marla details her evolution into one of the most respected and gifted psychics in the country. I'm in awe of her vulnerability and openness as she reveals her personal, intimate awakening and how this pig farmer's daughter tapped into the consciousness of Spirit. Her gifts are profound, and I am excited that she is sharing this inner knowledge with all of us. A brilliant and inspiring read!" "POWERFUL AND FASCINATING...Congratulations to Marla for writing a book that required a great deal of courage and that can help many people." "A fast-paced story of spiritual and psychic awakening from a brilliant wordsmith." "A highly entertaining romp through the hijinks of a successful actress turned reluctant psychic who found her way to profound forgiveness and atonement. Marla's story shows how insight and intuition can guide each of us on our own fabulous journeys—if we don't turn a blind eye to them. I couldn't recommend this book more highly." "Marla is a force of nature, and AMERICAN PSYCHIC is her funny, eloquent, dramatic and ultimately inspirational account of that forward motion. Hers has been a life brimming with bounceback. All who accept her invitation to share that life will not be disappointed. Renew all hope, ye who enter here." "Marla's transparency in AMERICAN PSYCHIC will crack you open, hold you, and teach you why it's wonderful to be you. Her writing engulfs you in her fascinating story of finding her voice... and then using it. She writes about transforming trauma into skill so beautifully and gracefully. Whether or not you believe in psychic ability, you will be mesmerized by Marla's tales and teachings and come away understanding how you can do the same. A MUST READ!" "Marla Frees' spiritual journey of discovery inspires us to look at our own psychological barriers that hold us back as we come face to face with love and death. Her message is an invitation to gain awareness of the profound connection that all beings, living and dead, have with each other and beyond." "You will love AMERICAN PSYCHIC. Marla shares the unvarnished unfolding of her gifts and gradual understanding of the larger reality in which she lives daily—a reality that is deeper and broader than the one in which most of us live. Yes indeed, Marla is the real deal." "Marla opens her heart and offers readers not only a fine story, but also the means to inspire a profound change in their own lives. Her words carry depth and power, and her caring about others shines through every interaction she describes." "A fascinating read that I couldn't put it down...authentic, heart wrenching and moving. Thank you, Marla, for sharing your story with the world." "Raw, real, exciting, vulnerable, and truly an experience, AMERICAN PSYCHIC is not just a good read, but a journey of healing. Reading Marla's story helped me heal part of my personal story, and I highly recommend it, especially for women who are looking for their voice and want to break through their barrier of fear and begin living a true, authentic life." "One of the most unique and entertaining memoirs I've ever read, filled with spiritual depth, profound wisdom, and poignant humor. Marla's journey is rich with adventure, colorful Hollywood stories, and emotional honesty that will inspire you to embrace your own life's journey in a more profound and healing way." "Masterful storytelling filled with gut-wrenching candor and laugh-out-loud humor...As Oliver Wendell Holmes stated, 'Man's mind, once stretched by a new idea never regains its original dimensions.' Marla Frees' AMERICAN PSYCHIC takes her readers on a mind-bending, perspective-altering, soul-expanding journey." 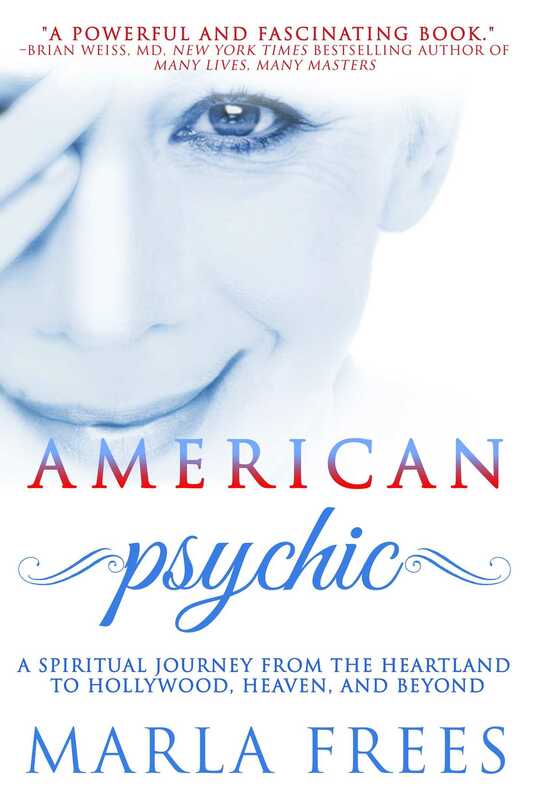 "AMERICAN PSYCHIC has the potential to nudge readers into an awareness of their own intuitive insights. The true gift, however, may be for those who are reminded of their own long-forgotten traumas and inspired to seek support in healing. I highly recommend this book that is so relevant in their American culture at this time." "With snark, pizazz, pure love, humor, and sheer magic, Marla reminds us that anything is possible and that there is more to life and death than meets the eye. This is a beautiful, truth-filled story. Marla is a transformational superhero, and after reading this book I feel more like one as well." "RIVETING...Full of grace, energy, and humor, AMERICAN PSYCHIC is a delicious smorgasbord of intrigue, mystery, and spirituality with a big slice of Hollywood thrown in for fun." "Resilient, radiant, and recklessly courageous, Marla is truly a champion." "A masterpiece of transformation... I was on the edge of my seat as I found myself laughing, crying, and feeling completely delighted through Marla's life-transforming realizations. The world needs this beautiful work." "An astonishing, edge-of-your-seat book. Marla's empowered and honest voice is a force to be reckoned with...what a ride and what a big, bold, beautiful life." "Marla Frees' American Psychic is the inspiring story of a good, pure soul working her way through life in a far-from-perfect world. It is the compelling history of an impressive woman I have had the rare pleasure of knowing through the years as a very talented, dedicated psychic whose main drive is to help others." "Marla Frees' American Psychic is a sensational read. While her extraordinary gifts are on display, this is far from the typical book by a psychic-medium. It's an insightful and compelling memoir that reads like a page-turner, and provides the reader a pathway through one's own pain to find love, forgiveness and a glimpse of heaven. As a successful Hollywood actress for 25 years; a sought-after, world-class psychic, and a seeker of knowledge beyond the five senses, you'll be amazed at the people she's known and impacted, and the astonishing adventures in multi-dimensions that have informed her wisdom. I couldn't put this book down and you won't be able to either!" "Marla Frees' American Psychic is beautifully transparent, soulfully empowering and breathtakingly uplifting. It is a magnificent accomplishment and a testament to her extraordinary Spirit. I am more grounded, expanded, humbled, and in wondrous AWE of God/THEMS from this exquisite memoir."